What is the Villa Louis Carriage Classic? 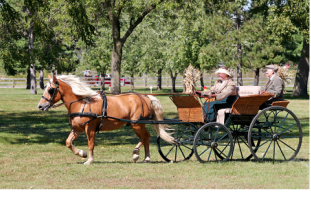 The Carriage Classic is a horse-drawn carriage competition held on the lawn of the Villa Louis Historic Site. The competition involves two venues on the lawn - arena competition where horses and ponies are shown put to various carriages and judged on driving abilities, equine performance, and overall impression; obstacle competition takes place on the lawn and includes driving through paired traffic cones in timed competition, cross country obstacles where drivers negotiate water crossings, bridges, and other obstacles that might be encountered on a country drive and other fast-paced obstacle driving classes with emphasis on speed and accuracy of driving. What are the different events and when? Working - most divisions Sunday mid-morning ~ 10:00 a.m. - 3:00 p.m.
What about lodging and other attractions in the Prairie du Chien Area? The Prairie du Chien Chamber of commerce publishes a Lodging Guide for your reference. Also, check the Prairie du Chien Chamber of Commerce Visitor Page for a list of attractions.